Supplementing the existing 35mm and 50mm f2 models, the new 21mm f2.8 features a similar external design, with an all-metal build, smooth focus and aperture rings, and yet it has modern features associated with digital bodies —focus by wire, a user-enabled de-clicking option for the aperture collar (using a supplied tool) during video capture, transmission of EXIF data, and compatibility with the camera’s auto live view magnification function to assist with focusing. 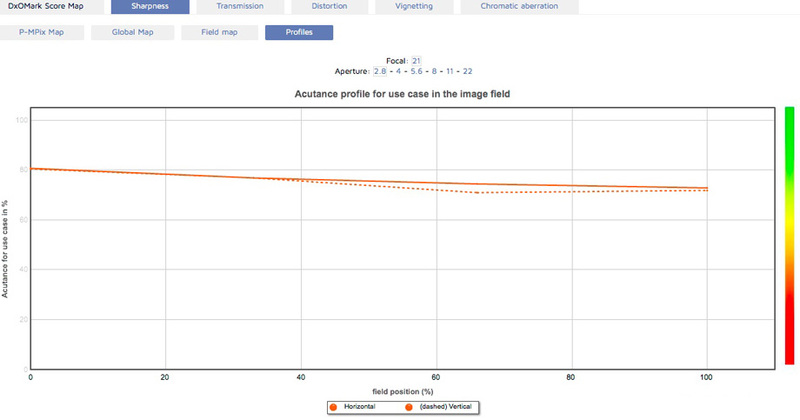 Internally, the lens features a new optical design comprising 11 elements in 9 groups using an assortment of anomalous partial-dispersion glass and a single aspherical element. The lens is notably smaller than the firm’s equivalent offering for DSLRs, featuring a small 52mm accessory thread, and measuring 2.44 x 2.83” (62.1 x 72mm) and weighing just 13.9 oz (394g). 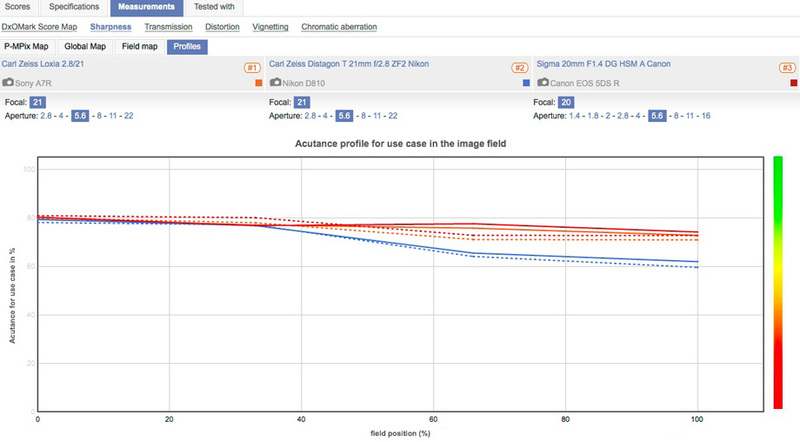 We’ve analyzed the lens across a range of E- and FE-mount models, including the full-frame 36-Mpix Sony A7R, and are delighted to share the results. 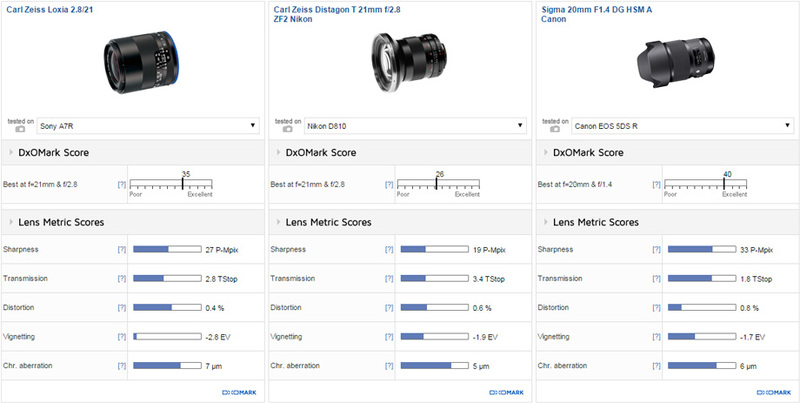 Tested on the full-frame 36-Mpix Sony A7R, the Zeiss Loxia 2.8/21 achieves a DxOMark lens score of 35 points, which is an excellent score for a super-wide like this. It has high sharpness and good flatness of field even at the maximum aperture, with stopping down improving sharpness mostly in the outer field. This makes the f/2.8 maximum a useful aperture when light levels are challenging. The lens has some mild astigmatism and lateral chromatic aberration, but it’s extremely well-corrected overall. Nowhere is that more evident than its control of distortion, which measures just 0.4% and is free of the troublesome complex-, or mustache-type distortion that’s common in lenses like this. Transmission is also excellent; however, vignetting is relatively high. What’s unusual about this lens is that it has outstanding sharpness wide-open, with excellent field flatness. Stopping down improves sharpness only very slightly, with most gains made in the outer field—though even then, the improvements are really only slight. As a result, peak sharpness is achieved earlier than most, at f/4. Distortion is very well-controlled indeed, with only very slight barreling noticeable in the center and none of the complex- (mustache-) type distortion that’s common with ultra-wides and difficult to remove using software. If there’s a weakness, it is that this lens has rather high and noticeable vignetting, at close to three stops (–2.8 EV measured) in the extreme corners at its peak, wide-open. Nor is the vignetting cured on stopping down, although it decreases somewhat. Zeiss already makes one of the most highly-regarded lenses in this focal length, the $1700 Distagon T* 21mm f2.8 for Canon and Nikon models. Although based on an earlier design for Contax SLR cameras, it’s already beginning to show its age on high-resolution digital cameras such as the 36-Mpix Nikon D810. It has noticeably lower peak sharpness than the Zeiss-Sony combination, and it is not as impressive at full aperture, where it actually performs well, although it shows signs of field curvature and slight astigmatism. At f/5.6 and onwards it performs similarly, at least centrally, but it is far behind in the outer field. 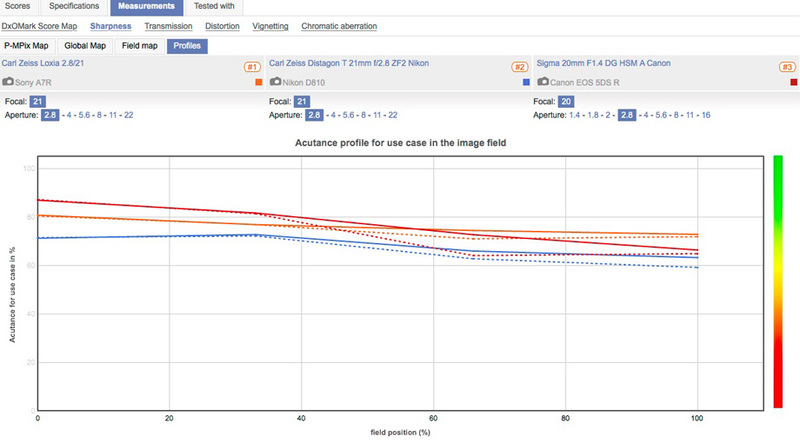 Comparing the Distagon ZF.2 model to the new high-speed Sigma 20mm f1.4 DG HSM Art, albeit fitted to the 50-Mpix Canon EOS 5DS R (as we’ve yet to analyze a Nikon-mount version), we can see that it is much more in line with the Loxia in terms of peak sharpness. And at f/2.8, it is ahead centrally, although the Loxia is still better in the periphery. The Sigma’s outer field improves on stopping down more, but even on the high-resolution sensor, it doesn’t outperform the Zeiss-Sony pairing. Of course there’s more to lens quality than sharpness, but it’s good to know that new models are keeping pace. 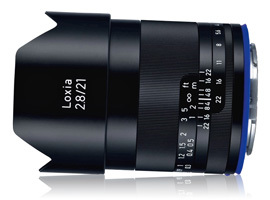 The Loxia has the lowest distortion of the three, with its sibling showing complex-type distortion, though it has the worst vignetting. 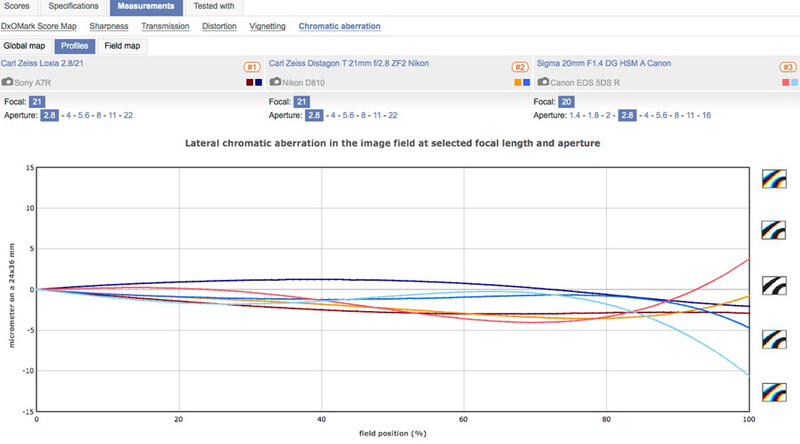 Chromatic aberration is well-controlled on all three, but while the Loxia avoids fringing in the corners, it has slightly higher levels mid-field than either the Distagon or the Sigma Art. While it appears that Sony is intent on following Canon and Nikon with large and heavy high-speed designs, Zeiss has recognized that many adopters of the Sony A7 series are looking to concede lens speed in return for compact and lightweight models. Of course, you do tend to get what you pay for, and optical quality like this is never cheap, but then the Zeiss Loxia 21mm f2.8 is an outstanding performer and a near perfect match to the size and weight of the Sony A7 models.